Last week, I talked about how to look at a land mass, and take a bit of a more realistic approach to creating it. This week, I want to take it a step further and try to define some of the greater geographic features and overarching climates created by Plate Tectonics, Wind Currents and Air Currents. This is the map I created after the post last week. Its jagged, barely functional, but you get the point. Its got tons of bays, a billion peninsulas and a jagged and ragged coastlines with some islands. It’ll work for what we have. I’ll be updating it each week as we get further and further into the process. So let us start with Wind Currents, as they are one of the larger influencing factors. Its hard to separate them from Mountain ranges and tectonic plates, but we’ll come back and address that in a little bit. Lets start with an overview. Winds, due to how the earth, while spinning, interacts with the atmosphere, have regular patterns. For our purposes, we are going to go with some really big generalities, in order to better understand the foundation so we can turn it to our purpose. Without land interfering, there are 6 bands of winds, and five bands of convergence. Three of the winds are in the northern hemisphere, and three in the south. There is a convergence zone on the equator, and two separating the winds in the north, again with a mirrored two in the south. These winds Follow distinct patterns, and can be summed up as Polar, Westerlies, and Trade winds. Polar winds blow from the east, and are called the polar easterlies much to everyone surprise. They take cold, polar winds from the north and drive them westward, to the Polar convergence zone, where they then rise into the atmosphere, warmed, and flow back to the top of the world to be cooled down and sent south once again. This band extends from about 60 degrees (Norway, Greenland, Alaska, Antartic), to the poles. The Westerlies, I am sure, surprise everyone by originating in the west and blowing eastward. These generally start around 30 Degrees (USA, Europe, Central Asia and Russia) and move North to 60 degrees, where the Polar convergence zone block further travel north. The wind will then, rising in the atmosphere because its warm and cooling off in the process, works its way south in the high atmosphere, cooling more as it goes and sinking to the earth around the 30 degrees to start all over again. Finally, the Trade Winds are the warm, pleasant, and steady winds of the traveled oceans. Originating just south of the 30 degree Westerlies, and blowing from east to west, it took sailors from Europe across the ocean to the warm equatorial waters of the Caribbean and South America. These are reversed in the Southern Hemiphere in north/south direction, but not in wind direction. The Polar winds blow from east to west, but flow northward to warm. The Westerlies originate in the west, but flow south as they cool once again, and the trade winds flow north towards the equator to warm up. This will be important later! The big things to remember is that where you are placed in the world will determine your overall wind patterns, the cold air from the trade winds making placed cooler than they normally would, and the warm air from the westerlies making things slightly warmer than they should be. 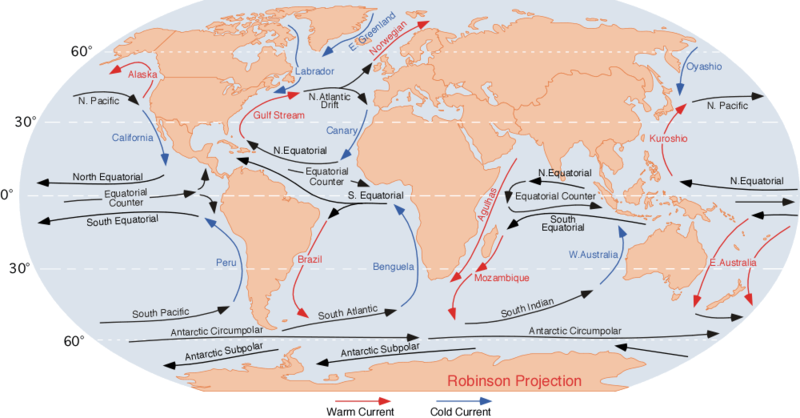 While wind currents allow you to understand where storms and water will come from, ocean currents are what really matter when taking it all into account in order to determine the climate of an area. Thankfully, with the winds out of the way, we can easily grab the Ocean currents and make a bit of a quick sweep. For the most part, ocean currents follow the winds, as the winds have the capacity to move the water, liquid as it is, though they are contained by oceans, rather than by the globe. The oceans, and really, most bodies of water, in a single hemisphere will follow the same patterns. In the northern hemisphere, cold water from the central latitudes flow south and east, then the warm water will flow north and west. This works in the North Atlantic with warm, Caribean waters flowing up the coast of North America, over the sea at about 40 degrees and dropping off on Europe and Great Britain, then cooling off and going south to warm up again. The South Atlantic reverses this, sending warm Carribean waters south along the South American Coast to scoot across the ocean and drop off in southern Africa and finally return to the equator. The poles, once again, have reversed systems of water current. This matters because warm water, and the resulting storms and evaporation, influence the climate of the world more than the winds do. The winds evaporate the water and build precipitation and storms that then hit land and drop off their heavy burdens. This warm water/warm wind effect is what keeps most of Western Europe Warmer than its latitude would suggest. Plate tectonics is a much smaller portion of the world building and climate determination than either wind or water is, but it can create some extremely out of place situations where you would other not expect them to be. Plate tectonics is the concept that the earths crust is broken into slabs, and these slabs are slowly floating in specific directions. Each different type of interaction creates a different type of formation. Plates move for the most part in one of three directions: towards each other, away from each other, or along each other. These boundaries tend to create mountains, and are often along the edges of continents. These regions also often contain volcanoes, though it is not an exclusive agreement. Not if, and where, the faults of your continent and/or planet are so that you can properly create some of the mountains. Do note, however, that plate collisions are not the only reason mountains are formed, and that is is exceptionally reasonable to have mountains no where near fault lines. What we want to do now is go through a few steps to make sure that our concept is making at least a bit of sense, and that it feels right to the players, even if they don’t know it. Is the continent in the northern or southern hemisphere? This will determine wind direction, ocean currents and Polar direction. Within the continent, is it closer to the poles, or to the equator? This narrows down both wind direction and ocean currents. So, to that end, I’ve added a few notes to my map from earlier. I’ve decided that the map is on the northern hemisphere, and large enough to be a large Island. Almost 1000 miles North-South and nearly 1400 wide. Large, a bit bigger than the Arabian Peninsula, but not nearly as large as the US or Australia. The Island is slightly southerly on the hemisphere, ranging from 28 degrees to 42 degrees north/south. This will mean the lower portion suffers the Trade Winds while the upper portion deals with the Westerlies. Also, this means that the water is generally Warm and mild on both coasts, though the west coast will tend towards Dryer, with the east coast tending towards wetter. The west coast is starting cool and getting colder, having traversed an ocean to get here, and the east coast is just starting to cool off, making its way north from the equator. Unless, of course, there are geographic formations standing in its way. With that in mind, I want to make the eastern peninsula a separate, small plate, pushing westward and creating a mountain range. where the two collide. I will likely also put a number of other mountain ranges on the land, but that will be for a later time. Warm water and air bring warmer temperatures to the west coasts in the northern hemisphere, and the eastern in the south. Cold water and air brings cooler temperatures to the east coasts in the north and western in the south. Mountains, where fault lines exist among others, can throw this all out of wack. Next week, we’ll look at Mountains and Waterways!